End of the Line: Long ago, those who were put to death were not done by injection, or through means that would be "humanitarian." It was done by the sword. A large heavy blade with a convex grind upon a very sharp blade. Used specifically for the removal of heads from the shoulders they were connected too. This sword is forged in the same way. 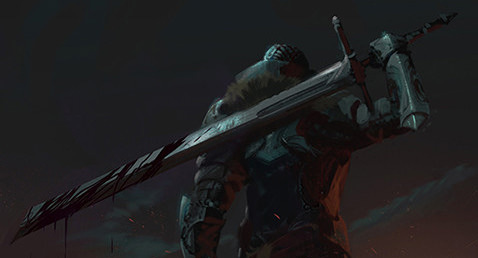 Using a Mono-molecular edge, and sharpened using Svolten Rhyolite, the blade is unnaturally sharp and can cut through just about anything other than thicker steels, and armor specifically used to protect against melee weaponry. That ain't a Knife, This is a Knife: As a massive two handed sword, used specifically to remove heads of humanoid beings, it can also remove limbs with relative ease, and even be used against creatures that are armored with strong carapaces, and hides. However, with the size, density, and weight of the weapon, Momentum is this swords greatest ally. Allowing the weapon to just plow through whatever material it is cutting through. This also means that it's weight, if it were to hit armor, it can cause massive kinetic impacts, and also batter weapons that are much lighter than it, to be beaten out of the hands of the enemy. Sword of the Sith: Created in the same fashion of the sith swords, it has all canon applications of the weapon. Namely the ability to be nigh indestructible, Reflect blaster fire, and the ability to absorb electrical energies and discharge them with the next strike. O' Holy Light: As a Dark sided artifact/weapon, the sword can be severely damaged, rendered inert, as well as destroyed by the Light side of the force in its purest form of application. Secondly, as the sword has the ability to hold souls within the sword, should the sword ever be destroyed, or rendered inert through the application of Force Light, those souls will be released. Pesky Lizards and Stones: Void bubbles, or Force nullification effects can decrease effectiveness of any abilities the weapon my have, or render the sword unable to use any force related abilities. It doesn't completely render the sword inert, and thus it won't release souls, nor trap souls within the sword. Ain't no Arming Sword: Created using a very dense metal, Zal Alloy, as well as the increasing of said density through the use of Sith Alchemy makes this sword nearly unwieldy. The pure weight and distribution of weight is so significant, it would take a person who is much stronger than your average human to even lift this. A standard human would require a specially designed power suit to lift the weapon, as well as the suit being heavy enough to prevent the swinging momentum from literally flinging the user in the direction of the swing. About the only being large and strong enough to lift this weapon naturally without more weight in their form, or increased strength would be a Null, or the larger scale Wookies, or other like beings. Using this sword in any kind of combat will be very difficult at best. In some cases, nearly impossible considering its size, or being used in confined spaces. This Train Stops For No One: Swinging this massive and heavy sword is quite the task in itself. However, attempting to stop this weapon mid swing, is quite literally, nigh impossible to perform. Having the center of gravity along the length of the blade, the size, and weight, would make any kind of effort to stop the blade be a futile attempt. Once this weapon has been swung, it is not stopping unless it hits something it cannot cut, stops from friction of cutting through too much material. Minds of the Lost: As a sword that traps the souls of individuals it has ended, the wielder of the blade will be in contact with these voices of pain. The wielder will hear these voices screaming in their ever perfect ears at all times. This can be quite distracting, and even cause forms of PTSD, summon fears of the user, or god forbid that the wielder listen to these voices wishing for the wielder to kill themselves. The souls cannot directly act against the wielder, control the blade or otherwise act through the force outside of the blade, or outside the side-effect of having their voice booming in the ear of any who attempt to wield this weapon. Longing Pain: After a time of using a Dark sided artifact, The souls of those trapped within the weapon start to seep into the wielders mind. Over time, or through constant interaction with the weapon, will cause the person to have mental breakdowns, succumb to corruption to the Dark Side of the force, Prone to outbursts of violence, Attribute mental decencies(PTSD, Multiple personalities, Lose Will to Live), and Suicidal thoughts or actions. Long ago, men and women were put to death by various means. Left in the jungle to die, given poison, put to "sleep," hung, and the most notable, was the removal of their head. Done by an individual known as an Executioner, This person was given the task to end the life of any person who was deemed so. Either done by a ruling body, or by a specific policing force. Notable tools of this trade were heavy weapons with the ability to cut clean through muscle, and bone. Namely, Axes, and Swords. Axes were used more often due to their effectiveness at the task, as well as having more weight driving down the head of the ax into the neckline, to separate the body and the head. However, for more ceremonial uses, The sword. Large, heavy, and with a special grind upon the edge to slice easily through flesh, muscle, sinew, and bone. The Sword, while simple in design, was used for more ceremonial purposes of those who were put to death. Having them kneel and sitting up compared to being thrown over the top of a stump, it provided the Death Row inmate, to sit up, and face the consequences. Theories were proposed that this was also to allow a more dignified death, than that of being treated like the common animal or dog being sent to the slaughter house. These massive swords were created for one use. And they did it well. As one particular individual, Shaun has become the ruling police force of the Donna for the Family, He is the Judge of your crimes, The Jury to decide your fate, and the Executioner to bring forth that ruling. This sword is the embodiment of that. A sword designed just for Shaun, to swing and remove those who are enemies of the state, and to end their life prematurely. As a man who wants to make sure that those he kills, will stay dead, The sword was infused with the dark side of the force. Specifically for the purpose of causing all those who fall victim of the blade, to have their soul trapped within the weapon. Forever stuck in nothingness, and a state they cannot leave. While the key to removing the souls is left unknown to any who face the man, one can assume it can be done through the purifying of Force Light. A sword that can hold souls, comes with the downside, of Shaun having to quite literally live with the demons of his past. May his mind stay sharp enough to deal with the voices that pierce his mind. Edited by Shaun Castanic, 04 August 2018 - 02:12 AM. Just going to throw it out there that a sword this big and this heavy isn't going to be something you'd be able to use in any given combat situation. The weapons you're basing this off of were used for executions, not for battle. If you want to make this lighter/smaller, that'd be fine with me. Lily Kuhn, I wanted the sword to be as heavy as possible considering what it was used for. So I only changed it from Extreme to Very Heavy. The point of the weakness of barely being able to use it was the idea for this submission in particular. If this is your only weapon? then sure go for it. However, if you have something else, I would recommend them use that instead of this sword.